This is the second in a series of download DVDs dedicated to tricks and routines using ESP cards. 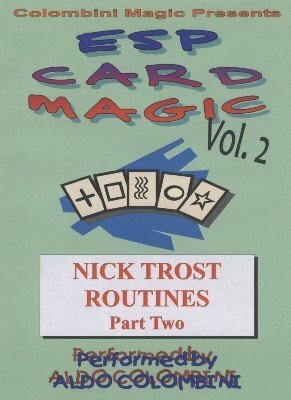 This volume 2 features routines by Nick Trost. THE POWER OF THREE: Three predictions are placed on the table. A spectator deals the deck into three packets and the top card of each packet matches the predictions. ESP DO AS I DO: A deck is shuffled and cut into two. A spectator picks a card from his half and you a card from your half. They match. You repeat this two more times. THE ODD SET: You place six ’sets’ of ESP cards on the table. Even though the spectator has a free selection of one of the ‘sets,’ he picks the ODD one. ELIMINATOR: You place a prediction on the table. The spectator picks a few cards by cutting the deck and you eliminate all but one: It matches the prediction. TRIPLE ESP MIRACLE: A triple miracle. Your three predictions match three mentally selected cards. ES-PAIR-ITY: You deal cards in pairs face down on the table. A spectator selects two pairs. The pairs not selected are shown to consist of different symbols. Then two selected pairs match. METAPHYSICS: Two spectators select a symbol each. You place the shuffled deck into your pocket and then you produce the two matching symbols. ESP DUCK AND DEAL: Eight cards are shown (say four Circles and four Stars). The cards are mixed and dealt into two piles according to the spectators’ wishes. When the piles are shown, all the Circles are in one pile, the Stars in the other. GEO-METRICK: You place ten ESP cards face down on the table. A spectator deals his cards on the table on top of your ten cards dealt before. At the end, all the pairs match. TRIPLE SYNCHRONICITY: A spectator picks three cards from a red-backed deck and you take three cards from a blue-backed deck. The three pairs of cards are all matching.